In today’s competitive marketplace, an ISO 9001:2008 certification has become crucial to securing and maintaining a company’s national and global business. Roemer Industries, Inc. a manufacturer of graphic identification products has been approved for a renewal of their current ISO 9001:2008 certification until January of 2014. ISO 9001:2008 is an international standard applicable to any manufacturing and service organization for establishing a business management system with a focus on system optimization and ongoing improvement. Created by the International Organization for Standardization, ISO 9001:2008 is based on eight quality management principles and when fully adopted, these principles have been proven to greatly enhance organizational performance. “What does ISO mean to you?” asks Mike Farmer, Roemer Industries’ General Manager. “Roemer is taking ISO to the next level and is working hard to become more cost-efficient and to constantly monitor and improve upon key business and customer satisfaction measures, internal communications, and product and process quality. ISO 9001:2008 has provided us with a passport to a global market and many, many satisfied customers,” stated Mr. Farmer. 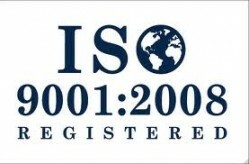 Certification for ISO 9001:2008 involves rigorous auditing and streamlining of processes and business strategies. The achievement of receiving such a certification not only enhances customer satisfaction and strong product quality but allows for Roemer to focus on continual improvements to their systems.